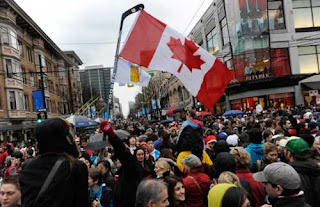 Just before 4 p.m. yesterday, a flash mob errupted into dance along along Robson St. to the tune of Dancing in the Streets by Martha and The Vandellas blaring over a loud speaker. Men, women and children faced East toward Thurlow Street, and began a choreographed dance. The moves weren't overly complicated, making the dance as accessible as the Macarena. After about three minutes of jubilation, the song ended and the dancers dispersed. The flash mob was the result of an elaborate planning process by a group called Imagine1day, a nonprofit organization that aims to provide access to schools and a primary education for all children in Ethiopia, Africa. They organized the event and four warm ups through Facebook, where about 3,000 people had confirmed their attendance to the final performance. According to Imagine1Day spokeswoman Sapna Dayal, “It was a really good way to bring people together in a fun, community way,”. Imagine one day, great name. Great event yesterday, uplifed the spirit of the streets after the stupid pointless display the day before. Street theater, the power of song, surprise, humour, impeccable, their concern seen by hundreds and heard by millions.